The author hooked into a 15kg Bay of Plenty kingfish on stand-up tackle. Whether you enjoy sitting in the lee of an island catching snapper, or you like pacing the ocean in search of yellowfin or marlin, it’s all the same. Fishing is fishing and the more of it you do the better you feel about yourself and the achievements accomplished with it. The waters off Tauranga, in the Bay of Plenty, cater for all types in the fishing community. The author with a 16.8kg yellowtail kingfish taken on 10kg line. 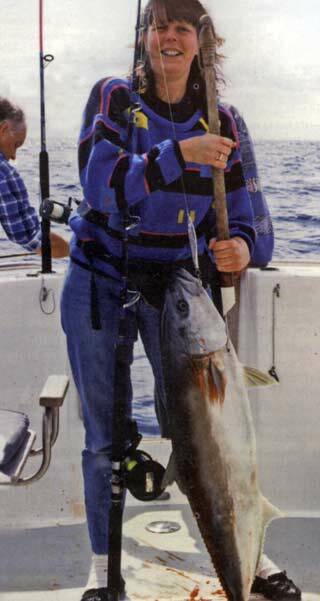 Most forms and styles of fishing are available in Tauranga. I am quite lucky to live only a few hundred metres from the water’s edge, where I can go and cast a few saltwater ﬂies into the harbour, and maybe entice a cruising kahawai into taking my offerings. So as you can gather, we are pretty lucky up here to have all this available on our doorstep. Now everyone knows that New Zealand is the best place to catch kingfish. The Bay of Plenty would be the kingfish capital of New Zealand, with areas like Mayor Island, Motiti Island and White Island holding large numbers of big kingfish. By big I mean BIG. A fish weighing 52kg caught on 15kg line in shallow water took the all-tackle world record, which is held at Motiti Island. This record was then equalled at White Island a few years later. There have been reports by some anglers who swear they have seen or lost fish bigger than this, and are willing to sacrifice parts of their anatomy to prove it. I think I will just take their word for it! 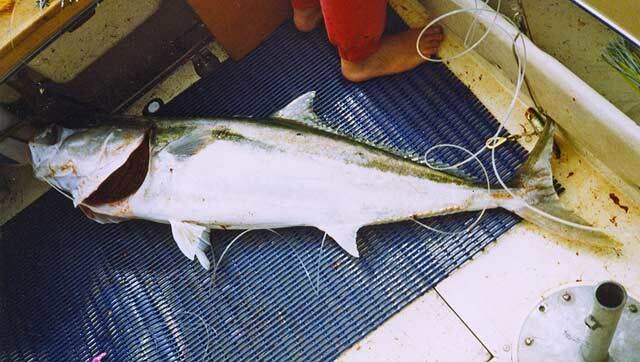 There are several methods of catching kingfish, but the most important thing is finding them. Kingfish love rocks and kelp under water. The reason is that little fish hang around structures under water. These small fish rely on the protection of these structures to hide from predators, so if you get an offshore structure such as a reef, add a bit of baitfish, then you should have the recipe for kingfish. Current also is very important to kingfish and their feeding cycle. Baitfish move with the currents looking for food and usually hold in an area when they find food or protection. That is why wharves in most harbours have kingfish about at certain times of the tide. A pair of good sized yellowtail kingfish with matching injuries that are almost certainly the work of the cookie cutter shark. The kingi on the left weighed 26kg and the other fish 24kg. Once again the wharf is another structure, so you can see how the cycle works. Kingfish can be found almost anywhere as long as there is food for them. Another important key is local knowledge of the area you are fishing. This can often be hard to obtain, but I have found most sports stores are more than willing to help. 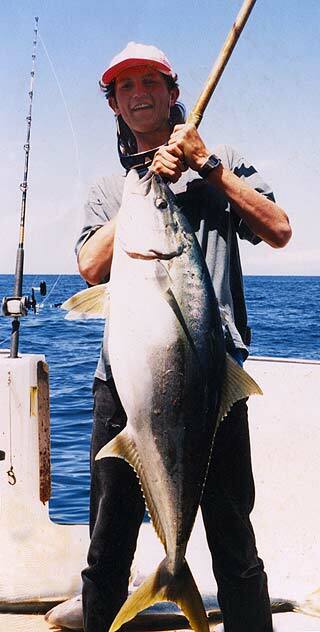 Live baiting is the most proven method for catching kingfish. A kingfish just cannot resist live bait swimming around waiting for it. There are many forms of live baiting, but two methods are most commonly used around here. During the summer months, kingfish spend most of their time in the shallower water. The rig we use is relatively basic but very effective. First, we tie a short length of 2kg nylon to the top eye of the swivel. On the end of the swivel, we tie a small snap swivel which we then connect to the balloon. This stops the balloon from tangling around the main line. The trace we use is 5 metres of 400lb mono with an 11/0 hook crimped to it. If you are wondering why we use such a heavy trace, it is because while targeting kingfish the odd marlin has been hooked, and it’s better to be safe than sorry when the big one gets on. The good thing about it is that it doesn’t seem to bother the kingfish. During the winter months, the exact same rig is used, but 200 lb mono and a 7/0 hook replace the heavier terminal tackle used in the summer. Sometimes a shorter trace is used, but I don’t think it makes much of a difference as to how long it is. The only reason for the length is the chance of a marlin during the summer months. During winter most kingfish head into the deeper water. In deep water, the rig used is weighted to get the live bait to the desired depth where the kingfish are. The amount of weight required varies from location to location. One spot could have a lot of current, requiring more weight to get down to the fish. The rig I use is again very simple, a 1.5-metre trace of 200 lb mono with an 8/0 hook tied and not crimped, with a ball bearing swivel on the other end. I then tie a 2 – 3 metre double using a spider stitch and then thread the required amount of weight on. The double adds a bit of protection from the sinkers as they slide up and down the mainline. You may ask why I put the sinkers on the main line. Well, the reason is simple. If a kingfish happens to bust you off on the rocks, the sinkers will just fall to the bottom and the fish will at least have a better chance at survival than it would be carrying those sinkers around. The bait itself is also very important. Over summer kahawai swim in great numbers around the reefs and are what we use for bait. 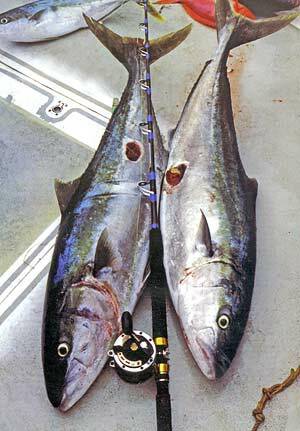 A 2kg kahawai is the norm, and even 10kg kingfish will have a go at these. It’s really interesting though, I once tried to put a kahawai into the mouth of a 10kg kingfish and it could barely fit. Winter has different baitfish and the kingfish are feeding on different baitfish as well. I find most mackerel and koheru the best baits for them. When a kingfish strikes, you just let it run long enough to swallow the bait, and then put the reel into gear and lift hard on the rod to set the hook. Simple as that! The time to let the fish run comes with experience, but fifteen seconds seems to be long enough. I have recently when fishing deep water, left the reel in gear. When a fish strikes the bait I just drop the rod tip into the water and then strike by lifting the rod hard or by winding as fast as I can. This method has increased my hook-up ratio and it also makes it easier to release fish, with all the fish having been hooked in the mouth. Bernice Padlie with a 14kg kingfish caught on a silver jig. Jigging was all the craze a few years ago but has slowly faded from the intensity it once had. There are still a few who jig for kingfish, and I am one of those who still love it. There is nothing more enjoyable than speed jigging for kingfish, using a method where you drop your jig to the bottom and retrieve it as fast as you can. This simple action seems to excite the kingfish into feeding mode, and the strikes you get can be amazing. The size of jigs used depends on water depth and current, not to mention line weight used. A good rule if using 10kg line is that a 100-gram jig should be used and for 15kg, a 150-gram jig. Sometimes heavier jigs may need to be used to keep the line as vertical as possible. For best results at jigging, the use of a depth sounder is a necessity. You have to ﬁnd where the kingfish are schooling. To find the school on a reef, just motor around until you find a likely looking school in mid-water. The best schools are the ones that fill the sounder from top to bottom. Once again practice makes perfect. Poppers work a treat on kingfish, but here we don’t seem to do so well with them. Most offshore reefs are either too deep and are better jigging, and in the shallow water, the kingfish do not seem to school that well either. There is the odd occasion though when the kingfish are on the surface. A lot of fun can be had by casting a popper and just winding it across the surface as fast as you can. This is new to most people but has been done in Tauranga before, in fact, most of the New Zealand and world records are held out of Tauranga. With kingfish being such tough fighters they are an excellent opponent on the fly rod. I’m yet to catch one on the ﬂy rod, but we do see quite a few in the burley trail while fishing for snapper. I’ve been told it’s not easy, so I will give it a good go and let you know how I go. Dead whole bait such as piper, saury and pilchards can be devastating on kingfish, especially ﬂoating back in a burley trail. Many a good kingfish has been caught this way, but quite often by mistake when the bait was intended for snapper. The key to this method is plenty of burley. Lastly and most important is the tackle. I can not stress highly enough to you about having the right tackle. Gear that cannot stand up to the pace will end up frustrating you when that fish of a lifetime comes swimming along and takes your offering. When live baiting we use 24kg and 15kg stand-up game outfits, which can handle anything a kingfish dishes out. The stand-up outfit is so versatile for this type of fishing, giving you tremendous lifting power. I prefer 24kg, as sometimes the odd marlin puts in an appearance and it’s definitely an advantage. 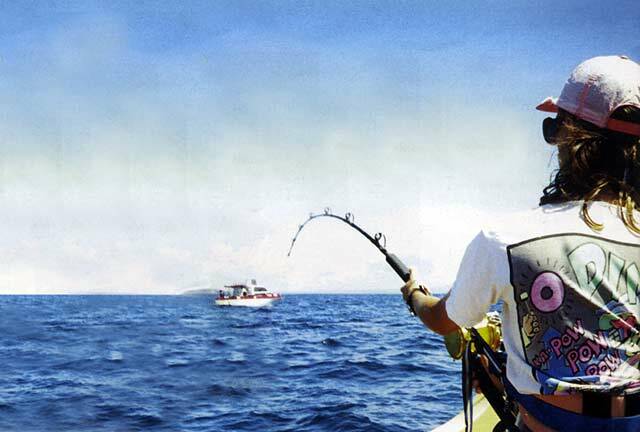 When jigging, use a 10 – 15kg line with a heavy action fast taper rod of around 6ft. The reel should be one with a fast retrieve, around the 5:2:1 or 6:2:1 ratio. I prefer 10kg line myself, as most kingfish tend to be smaller than bait caught kingfish. With poppers and dead bait, we also use the same outfit. I would recommend using 15kg line to start with, as you may lose a few fish on the bottom on 10kg. For saltwater ﬂy outfits, I would say go for the big gear, 12wt or more. You are going to need it with the way kingfish fight. Also look out for those thumbs! So that is how we do it here in the Bay of Plenty. I hope some of these tips help you catch more fish, as it took me a long time to get it right. The good thing is I am still learning new tricks with this sport, and I would say I always will. A 20kg plus yellowtail kingfish. Note the 400lb mono trace coming from its mouth.